I’m the sister in this duo named Cookie, and my brother is Canelo. We have been together from the day we were born; yes, we were littermates. As an extremely bonded pair, we definitely need to stay together in our forever home! 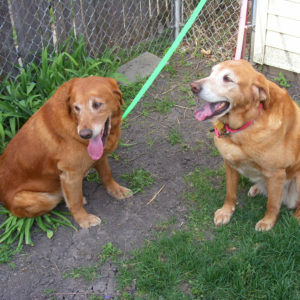 We have the coloring of our golden dad and coat of our mom the Lab. We think we have the very best of two wonderful dog breeds with that combination, don’t you? We are great on walks and get along well with the other dog in our foster home. 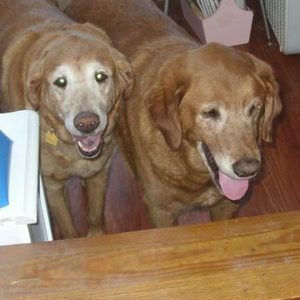 We have experienced all kinds of new things while being fostered and have adjusted really well. We are very easy going and wonderful house guests. We haven’t had accidents and settle down nicely. We are both very affectionate and love to follow our foster dad around. We are on the larger side (around 90 pounds), so we each need to lose about 15 to 20 pounds. We would love to find someone that will continue our walks and weight loss regimen to help us get our figures back to where they should be. If you are looking for double the love from two sweethearts, then we are your pair. We can’t wait to find our forever family … might it be you?